The worst field trip. Ever. Several Saturdays ago, a family friend by the name of Mdm. Trim, invited me to go on a field trip, to visit an organic farm in Johor, along with a couple of other tourist locations. It was suggested to me that the field trip would be an opportunity for me to get to know some of the other friends and acquintances that Mdm. Trim had managed to drag along for this excursion, namely people who are often too preoccupied with their work or other activities to ever have had the time to meet new friends. Personally, I am never against meeting new friends, and quite so eagerly I accepted the offer. And before the field trip, Mdm. Trim suggested that I should do some sort of makeover. Apart from buying a new, expensive branded shirt to wear, I also went for a haircut, for Mdm. Trim advised that my previous smart, center-parting hairstyle was rather old-fashioned and tended to scare away people (?). And I was recommended to get a new spiky hairstyle which I thought looked like a cross between a Mohawk and a conehead, but it was assured to me that this new style was much more attractive to people than the earlier one. We assembled at the meeting point in the school, where I introduced myself to the guys and girls that Mdm. Trim had invited for the field trip. Occasionally I would try to start a conversation, but most of the time the girls tended to only cluster and talk among themselves. Any conversation that I initiated was quickly ended by a one or two word reply from her. And it wasn’t helped much when I was assigned to sit next to a Malay girl for the entire bus trip, whom I had no interest in getting to know. In addition, one of the girls looked like she was already going steady with a guy who also came for the trip. I thought it smarter that I should no longer distrub them. In fact, during lunchtime, the entire conversation was hogged by some guy who was boasting about his experience of having climbed up to the base camp of Mount Everest. I don’t even think that I had the opportunity to say much during lunch. I wonder if my experience of having climbed Mount Kinabalu would have impressed anybody, should I have bragged or boasted about it, before someone else does about some mountain higher. And for the dinner, I was not seated next to any of the girls again. This time I was between Mdm. Trim, and some guy. Hey, look. I got no interest in knowing guys, it will not be very helpful to me. And Mdm. Trim was taking photos of people around the table, girls posing as sisters, guy with girl. But for me, it simply had to be with some guy that I had no interest in seating next to, leading me to comment that "you have got to be kidding me." As the bus returned to Singapore, I was hoping that, perhaps after getting off the bus, I could exchange contact details with the girls, or maybe even offering to drive them home. Instead, what happened was that, just before the bus entered the school gates, the girls quickly got off the bus already, and were quickly saying goodbyes and moving off in their separate directions! Arghhh! Screw the whole thing! It is not as though I didn’t try, I did go for the trip after all. But pretty much nothing happened in my favour. Nevertheless, I still welcome whatever opportunity to get to meet potential friends, and I would still continue to accept outing invitations from Mdm. Trim, of course, provided that she can remember to invite me to join in a dinner outing with friends at some Orchard restaurant that she actually thinks that I would never find out. But I’m keeping the hairstyle, while it lasts. A unique opportunity has allowed me to proceed with this Indy custom figure, which initially I had not expected to create. After escaping from captivity with his Dad, Indiana Jones went to Berlin, in order to retrieve his Dad’s Grail diary, which contained clues vital to the search for the Holy Grail. The diary had been stolen by Dr. Elsa Schneider, the female Austrian Nazi who had hoodwinked both Indy and his Dad. 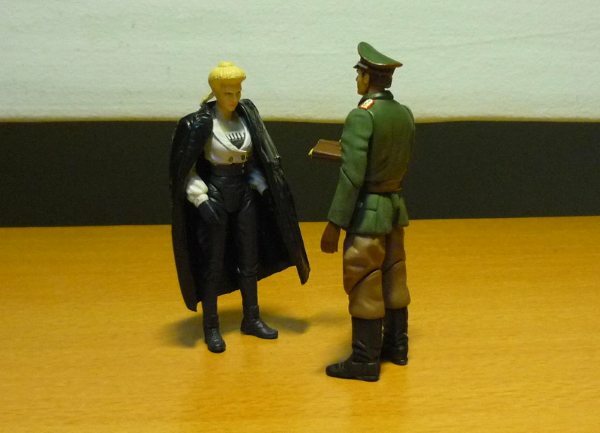 Disguised as a German officer, Indy confronts Elsa during a Nazi rally, and takes the diary back from her. 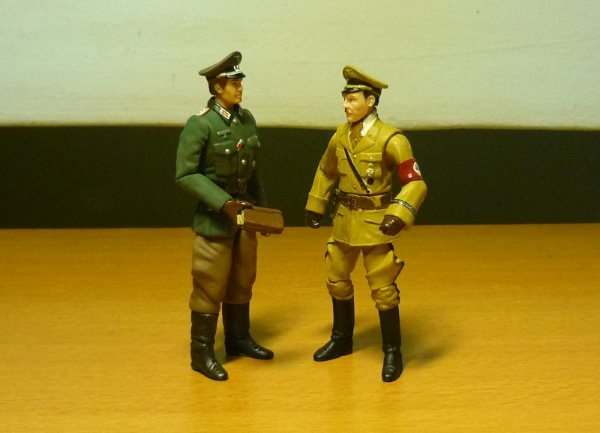 A series of 1:18 scale WWII German soldiers went on sale recently, and being a history buff myself, I bought the set of six German soldiers for my own collection, perhaps even to display alongside my Indiana Jones figures since they are of compatible scale. 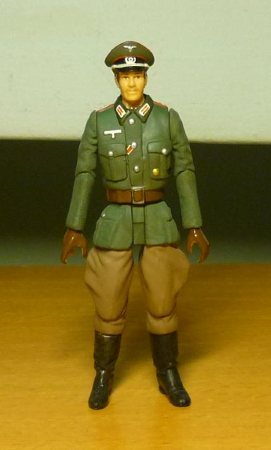 Shortly thereafter, I realised that one of the German officer wears the exact uniform that Indiana Jones wore for disguise in “The Last Crusade”, this figure could serve as the perfect base to customise an Indy in German officer disguise. 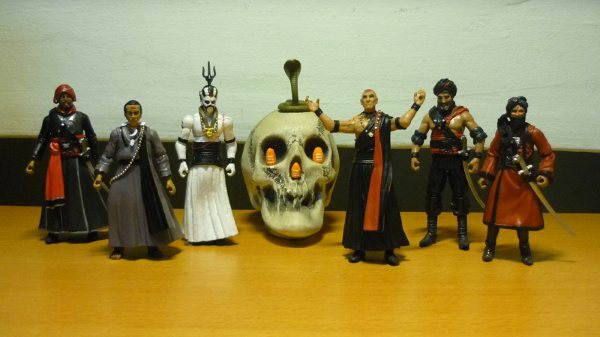 And it so happened that I already had the head and hat parts available as spares, leftovers from my earlier customs. The head of the original figure was removed, and the remaining neck was dremeled away, to create the socket to implant the neck. The neck itself was cut out from a spare Indy torso, with its sides dremeled down to fit into the neck socket. Acrylic was used to glue the neck down. Most of the other work consisted of changing or adding additional details and the paintjob on the uniform. You cannot believe exactly how many details I had to take into account in order to make the uniform as screen-accurate as possible to my own satisfaction, these include the rank insignias, epulets, badge on the hat, additional badges on the left pocket, button colours, the ribbon on the shirt button, and even the red edges on the hat. I don’t think that anyone else would ever pay attention to so much details when it comes to customising a 1:18 scale figure. 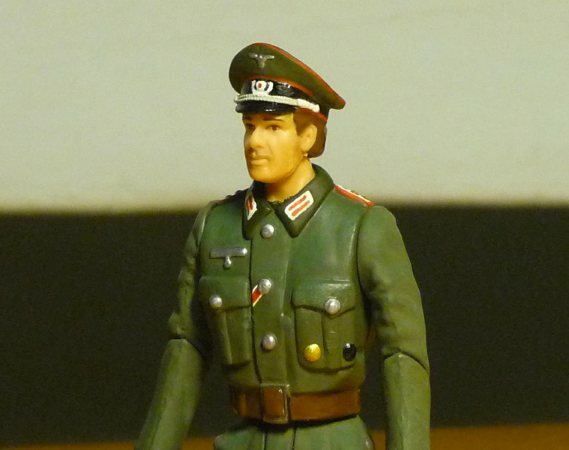 A close-up of the finished custom figure. Imagine trying to paint that hat badge, and the collar ranks. At 1:18 scale, it’s not easy. After retrieving the Grail diary, Indy tries to get away but he gets pushed into the rally by a crowd, where Indy bumps into the German dictator Adolf Hitler. Hitler assumes that Indy was just another Nazi follower, and he promptly signs his autograph into the diary. Hello world ! A recent renewed interest in Indiana Jones has allowed me to gain the inspiration to continue with some of my half-finished Indy custom works as well as proceed with several of my other planned customs. 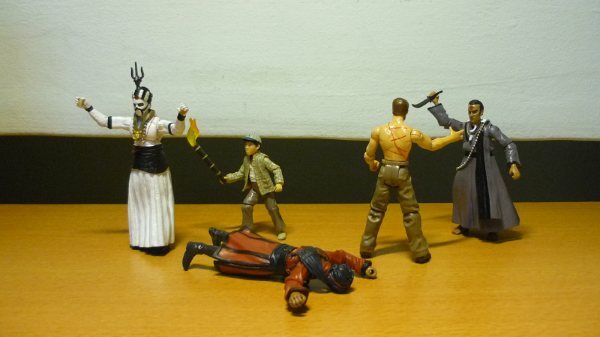 And here I present the latest addition to my awesome Indiana Jones custom figures. Chattar Lal was the Prime Minister of the Pankot Palace when Indiana Jones arrived at Pankot to investigate accusations of Thuggee cult activities. Unbeknownst to Indy, Chattar Lal was a willing acolyte of the Thuggee cult, and shortly after Indy was captured and brainwashed into beliving in the cult, Chattar Lal and Indy joined in the sacrificial ceremony of Willie Scott. 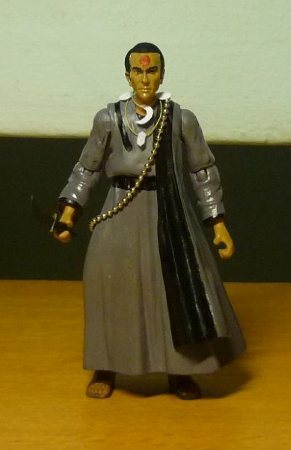 A recently released Star Wars figure had an evil-looking face which I thought resembled that of Chattar Lal. And since I could readily obtain the other parts required for creating Chattar Lal, I decided to proceed with this custom. Epoxy was used to sculpt the robe on the torso, and it was also used for attaching the sash onto the torso. The sash itself was cut from the Monkey Man’s inner vest. A difficult part to making this custom was in trying to mix the Indian skin colour and painting the face. As a general rule, I try to avoid painting on the face as this is very risky. It is very difficult to rectify if the eyes were accidentally painted over, and it was also very troublesome to paint the eyebrows. The necklaces are pieces of cut paper glued onto the thread, and the beads are one of those beaded keychain rings. Thuggee group photo shoot ! The Thuggees were no match for Indy and his loyal sidekick Short Round.